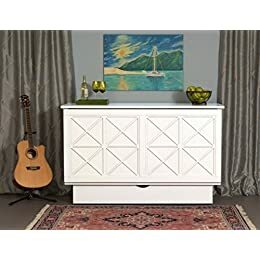 Are you planning to buy a cabinet bed, but don’t have any idea where to start? If yes, then you have visited the right place. In this post, we reviewed five of the best cabinet beds that are currently available on the market. Actually, this will narrow down your options allowing you to choose the best with ease. Apart from that, we will also include a buying guide that you can use as a basis when choosing the right model that suits your needs. But before anything that, let’s first define what exactly cabinet beds are. Cabinet beds can actually offer a great sleeping arrangement while taking up lesser space. Furthermore, it serves as a bed that’s very comfortable but not distantly near to being stylish. And when it is time to fold it up you can use it as a normal cabinet storage bed in your apartment or living room. Actually, you can store pictures, books, and even magazines. Cabinet beds, on the other hand, are truly functional furniture. Because apart from being a bed and storage, you can use it as a desk or sofa as well. What’s more, these beds can add a style to a boring and blank space. Now that you already have an idea what exactly cabinet beds are, let’s take a look at the five best cabinet beds that are currently accessible on the market. If you’re looking for Murphy Cabinet beds in a very customary wood color, then this queen size model is perfect for you. 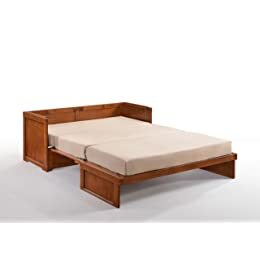 This cabinet bed is made using solid wood to ensure durability as well as offer comfort to every sleeper. The Night & day Furniture Murphy Cabinet bed has plenty of storage space for your stuff. On the other hand, when you have expected visitors, you won’t feel any stress since it can be assembled with ease. Further, this cabinet bed sports a sophisticated design that is highly adaptable in any spaces and it will complete the style of your home decorations. The cabinet bed also comes with a 6” memory foam mattress that is gel-infused. As a matter of fact, the mattress tucks in tidily when closed and folds to three. Another good thing about its mattress is that it is backed with a 3-year warranty. While the cabinet bed itself is covered by 10 years warranty against structural defects and materials. Nevertheless, this product features dual power ports that have USB space to connect. Thus, problems of charging your electric devices with this bed isn’t a big issue at all. It can be moved around your room and fit under a window. Though it’s very easy to assemble it may need helping hands. 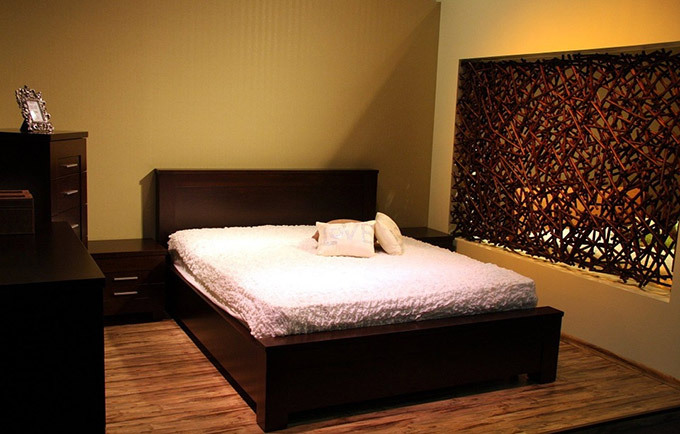 With this bed from Atlantic Furniture, you will be able to offer your visitors a very comfortable and cozy night sleep. And apart from that, you will keep a similar style of your household thanks to its elegant design and white color. The Atlantic Furniture Nantucket Murphy Bed Chest is designed with rubber wood that assures stability and longevity at the same time. On the other hand, you can place this bed in your living room and you can use it as a storage space. This product is designed very well to save you space and time during the assembling process. 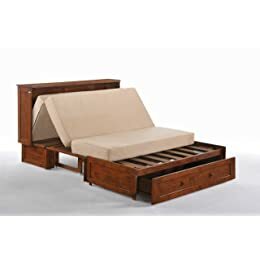 As a matter of fact, it features a distinct construction style which lets you utilize it as a bed at night and storage in the day. In addition, it comes with a 6-inch cool soft gel-infused memory foam mattress and it can be divided into two parts: 1-inch coolsoft memory foam as well as 5-inch strong support foam. Nevertheless, it also features USB charging ports. 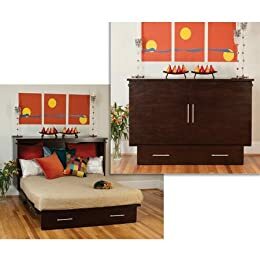 This cabinet bed is a cheap alternative to Murphy cabinet beds. The Arason Enterprises CredenZzZ has a nice color finish which blends well with any home decorations. Further, it looks beautiful for any guest room, loft, studio, condominium, and house. With item, you will obtain a sophisticated cabinet bed that has a modern look thanks to the woolly aluminum bar hardware coupled in this bed. Similar to the first two products, also comes with a 6” by 4” memory foam mattress that folds into three and very comfortable. On the other hand its easy-to-use style will allow you to open and close the bed easily. Further, it can be assembled in just a few minutes. For that reason, you will not have a hard time converting it from bed to a storage cabinet. This cabinet bed doesn’t consume lots of space providing you a chance to utilize your extra space for different stuff. What’s more, it comes equipped with spacious and multipurpose drawers that you can use to hold your beddings and pillow. Nevertheless, this cabinet bed is sturdy and strong enough to support up to 500lbs. And it is a great sleeping solution in small rooms which serve as a guest room and for vacation condos and studio apartments as well. The lower bedroom is quite difficult to access. This queen size and cube style cabinet bed from Night & Day Furniture is designed with rubber wood to ensure durability as well as comfort. Similar to other Night & Day Furniture cabinet beds, this model is also backed with a ten-year warranty. In addition to that, this cabinet bed also comes with a memory foam mattress that is gel infused. Thus you’re certain that you or your visitor will have a comfortable night sleep. On the other hand, this murphy cube cabinet bed can be converted with ease. Actually, you can convert it from bed to storage or vice versa in a minute or two. When closed, it only consumes ten square feet of space. And there’s no doubt, it is a user-friendly cabinet bed. If you want to convert this into a bed, you don’t need to remove the stuff from the cabinet’s top. All you have to do is move your things to the back, lift the flip top and then open the bolts so that you’ll be able to release its front panel. On the other hand, this cabinet bed is very easy to open and close and can support 500lbs. Further, it comes equipped with a nine-inch drawer for your blankets or beddings. The Arason Essex CredenZzZ Cabinet Bed comes with a tough memory foam that is 6-inch thick. The mattress has a 2-inch of softer foam (top) and 4-inch base foam. Either way, the mattress can be folded into three and backed with a one-year guarantee as well. When it comes to buying a cabinet bed there are some important things that must be taken into consideration so that you will be able to obtain the best value for your money. Read on to find the things that you need to consider when buying. Cabinet beds have different finished. You will need to select from paint, lacquer, water-based finishes, and oil-based finishes. So before making a purchase make sure to do your own research to see their differences. When it comes to bed frames there are lots of materials where you can choose from. That’s why if you want to use your cabinet for a longer period of time make sure to opt for a model that is equipped with a durable and resilient frame. 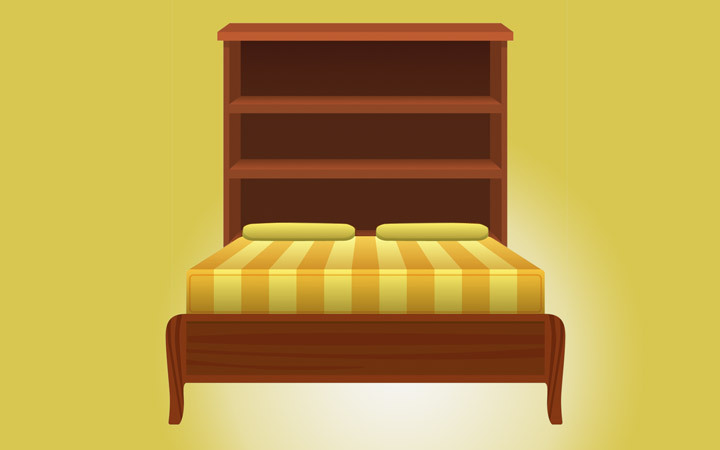 Typically, luxurious beds utilize solid wood from cedar, oak, mahogany, and among others since they tend to last longer. As you can see most cabinet beds comes with a memory foam mattress. In the actual fact, this kind of mattress can support each part of your body and often, they prevent and relieve pain. In addition, it is also comfortable to lean on allowing you to have a soothing night sleep. For these reasons, opting for a bed that has a memory foam mattress is highly recommended. When it comes to the height, most cabinet beds only accommodate a 9-inch mattress. Check if your chosen item is easy to setup, assemble, and user-friendly. In fact, if you ignore this factor, believe it or not, you will be the one to suffer most especially if you’re living alone. Nevertheless, considering the product’s cost is also crucial. As you can see, cabinet beds are not for daily use. But there is no doubt, such beds are significant when it comes to giving a comfortable night sleep without consuming a lot of space. Either way, all the products that were viewed in this list can be a great investment. 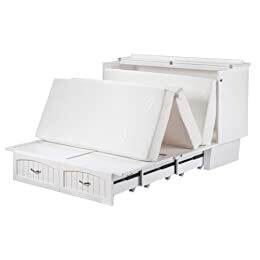 They sport a great design, comfortable, functional, and will allow you to have a bed or extra storage space in no time. So, are you ready to buy one? If yes, hopefully, you can find the best model that suits your needs in this post.